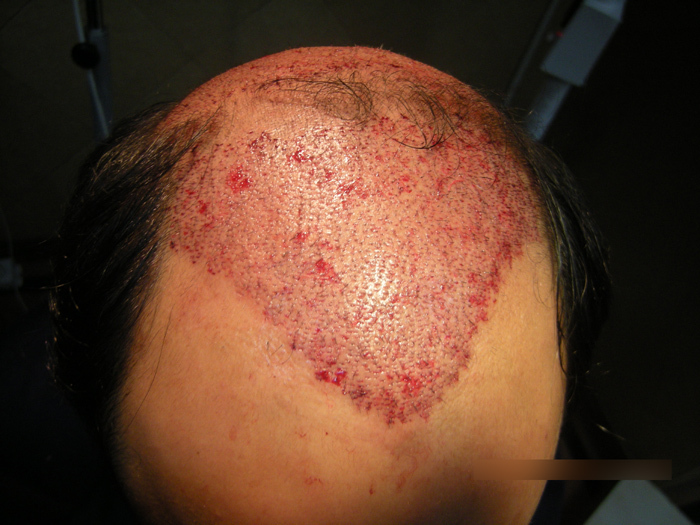 Different patients chose varying paths to their hair restoration. Advances in techniques and increased awareness of the same among patients, has resulted in them having more options when it comes to fitting the HT into ones own life. Patient nicknamed traveler has a NW 6 level of hairloss. He chose an unconventional approach to his first HT session. He visited us for a follow up at 4 month mark. We expect average 30% growth at this stage. Following is a self explanatory photo sequence. Hello Dr. Arvind, where exactly were the beard grafts placed? have they grown at all? Also Ive asked this question before but did not get a reply from the forum and my question is, since i have more body hair then i want, it grows faster then my scalp hair, is thicker and grows in 2 and 3s per follicle, would i have a better chance of the body hair growing then someone with wispy weak body hair? What is so unconventionalabout this HT? It looks great to me. » someone with wispy weak body hair? Detailed information and guidelines for the correct use of body hair are available at these links. Please go through them. In this patient the beard grafts were placed in most areas (crown and vertex), but not in the hairline frontal area. Yes, the beard hair has also started growing. Usually, I have found beard hair starts growth a few weeks earlier then the scalp hair. » What is so unconventionalabout this HT? It looks great to me. The usual approach is to transplant one area at a moderate density (usually the frontal and top areas), before transplanting the crown. This approach, however, is not one that all patients prefer. Most people often also want the crown to be covered, even if at a lower density. Transplanting the crown swirl area at approximately 25 to 30 grafts per sq cm. This way the patient gets coverage over a larger area. He retains the option to increase the density in these areas at a future date. I remember that you said once that you do not like to go back into an area twice. Has this changed at all due to current techniques? » twice. Has this changed at all due to current techniques? Its true I prefer to complete transplanting one area of the scalp, before doing the other. However, in a suitable patient, who understands all the implications and has formed a viable plan for his hair restoration, I give equal weightage to the patient’s choice. After all, its the patient who is going to fit the hair transplant into his life. Finishing the transplant for one area means that we do not need to buzz the transplanted hair again to thicken them. When areas involved are huge, transplanting at a very low density is not going to do much improvement. In fact, it can be counterproductive in certain instances. Why?! To understand that we have to understand the difference between natural thinning and a thinly transplanted bald scalp. A naturally thinning scalp, (lets say crown area), contains a mix of some terminal, thick calibre hair with a lot of fine vellus hair. Contrast this with a crown containing all transplanted, thick calibre hair. Now, as long as one transplants till, in my experience, as low as 25 to 30 FU grafts/ sq cm, its still possible to pull off a thin but natural look. In most hair types that is. The moment you go below 20 FU grafts/sq cm, (and the area is not hidden by surrounding hair growth), the terminal, thick calibre hair will stand out. More so in case of straight, dark colored, thick calibre hair. Those with thin calibre, light colored and/or curly hair may just about manage to pass casual scrutiny at this density. This has to be kept in mind when planning multistage low density sessions. Please let me know if you have any queries on this subject, because this is, in my opinion, a very important aspect. » is, in my opinion, a very important aspect. Thank you for your reply and I hope you are enjoying the New year. One area that you did not mention is possible transection of the grafts transplanted in earlier work during subsequent transplants. Transplanting between native hair is known to be tricky but at least native hair has fairly clear angulation by simple inspection. When hair is transplanted then I assume that scar contraction in the recipient area is not very predictable and could increase the variation in the angle of each hair. As a result is it more difficult to transplant between such hairs with confidence? Also is the very existance of pre-existing scars detrimental to subsequent transplants? » » someone with wispy weak body hair? » available at these links. Please go through them. » earlier then the scalp hair. Good work. You might remember me, I probably had something similar (both front and crown). I am still doing ok. Lost some hairs probably because of job stress, etc. Is the patient on finasteride or rogaine? can we see his scar? » Thank you for your reply and I hope you are enjoying the New year. » transplanted in earlier work during subsequent transplants. Transection of grafts is a possibility if the recipient slits are not made parallel to pre existing hair/previously transplanted grafts. However, by buzzcutting hair absolutely short it is possible to gauge the exact angle and direction of the previously transplanted hair. If the previous grafts were made in the correct/desired direction, then transection risk during the second thickening transplant is minimal. As long as the doctor keeps in mind to cut the hair really short and make the recipient slits parallel and in between the previous grafts. In fact, the risk of transection is less when transplanting between previously transplanted hair as compared to transplanting between pre existing hair. This is because, in nature the hair roots of the follicular unit splay randomly while going down the dermis. OTOH, the transplanted grafts are “neatly” located in a 2 dimensional slit. Same for the vascularity. Correctly performed hairtransplants will not compromise the vascularity of the scalp to any significant extent as far as growth of grafts transplanted the 2nd time. All of the above assumes that the transplant was performed in the correct manner. A wrongly performed transplant can leave scar tissue, reduced vascularity and all their attendant problems. I hope the above helps a better understanding of the subject. Regards and best wishes for the festive season. » Is the patient on finasteride or rogaine? » can we see his scar? Nice to hear from you. Are you still using Nizoral regularly? Is it still giving sutained benefits? I will try to locate Traveler’s strip scar pictures and post them in the new year. Traveler, by his own choice, is not on any medications to prevent hairfall. Wishing you and your loved ones a very happy 2010. » » job stress, etc. » » Is the patient on finasteride or rogaine? » » can we see his scar? » Wishing you and your loved ones a very happy 2010. Yes, I am still using Nizoral at least 3-4 times a week. I believe it is helping.